What 4th Graders Have to Say! Missouri River Days is a half-day field trip on the Missouri River at Eagle Bluffs Conservation Area, in Columbia, MO. 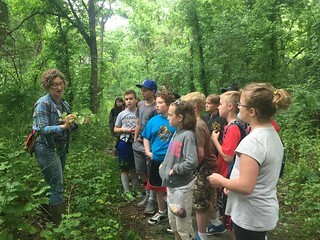 This field trip is offered to the entire 4th-grade at Columbia Public Schools during three specific times in the fall and spring school year. During Missouri River Days, students will leave their lab coats and pocket protectors behind; to do science, Missouri River Relief style. They will investigate the mysteries behind the longest river in North America and learn what makes it tick. Missouri River Days in the Media! View photos of Missouri River Days on Flickr. 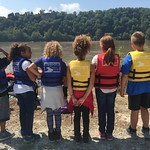 During Missouri River Days, students will develop a better understanding of the Missouri River through four experiences that are 30 minutes in length; each activity should have a max of 30 students. 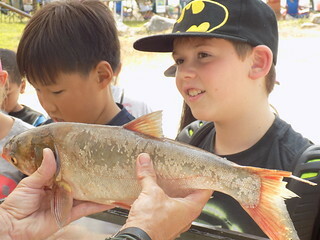 Students get up-close and personal with the fish that call the Missouri River home as they meet some of the scientists that are helping the river's ecosystem. Using the cottonwood forest as our laboratory, students will make careful observations, ask questions and use a dichotomous key to identify a Missouri River tree. Students will create watercolor sketches and notes as they explore the data, research, and sketches from the scientific journals of Lewis and Clark. For a one-of-a-kind learning experience that incorporates spectacular views of the Missouri River, students will learn about the channelization of the river from knowledgeable MRR staff. Click here for photos from Mill Creek Elementary Schools on May 11th, 2017. How is safety going to be handled on the river? Safety is our number one priority; we will provide students with a safety talk and lifejackets before going on the boat ride. Students and/or teachers do not need to know how to swim because we will not be entering the water. Experienced boat captains pilot our 24-foot aluminum plate boats that have all completed boat operator training and are assisted by deckhands. What type of boats will students we be in? Students and teachers will be on the Missouri River in a 24-foot open boat, with an aluminum plate and 115-horsepower marine motors. Who needs to sign the risk release form? How should I prepare my students? Dress comfortably, bring a jacket and hat come prepared for the weather. Columbia Tribune Article about "Missouri River Days"
Columbia Tribune education reporter Roger McKinney wrote this great article "Fourth Graders Experience the Missouri River" about the Spring 2017 Missouri River Days, with fantastic photos by Timothy Tai. Missouri River Relief (MRR) is a not-for-profit organization whose mission is to connect people to the Missouri River. We do this through hands-on river clean-ups, education programs, and outreach events. Since our founding in 2001, MRR has hosted 160 Missouri River cleanups, bringing 23,985 volunteers to help remove more than 876 tons of trash and teaching over 18,584 students and teachers about the Missouri River. To learn more, visit: our website. 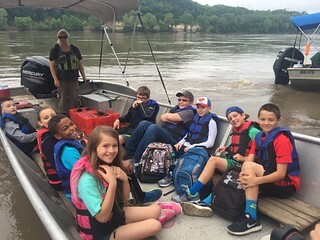 Missouri River Relief is proud to be a part of Columbia Public School District’s Partners In Education Program and is partnered with the Columbia Public Schools Science Department to offer this program.